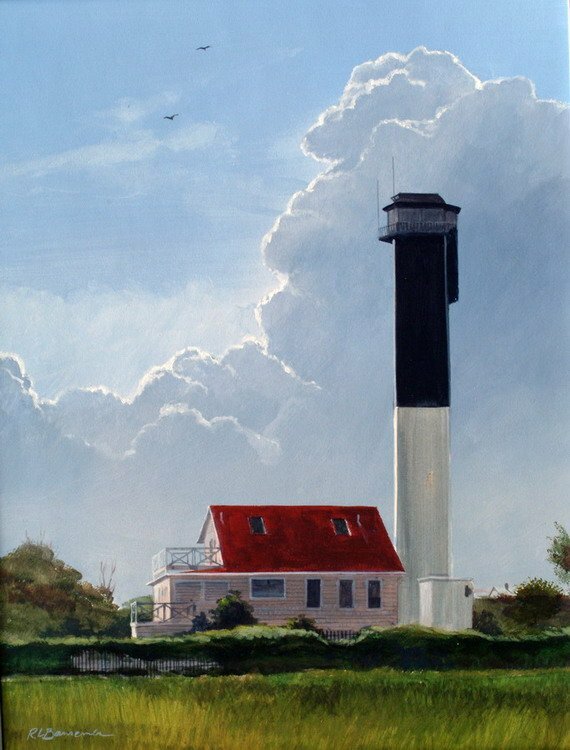 The Sullivan Island lighthouse near Charleston, South Carolina replaced the Morris Island light just across the Charleston Harbor. Built with steel girders and sheathed with aluminum panels, it stands one hundred and sixty-three feet high, almost twice as high as most lighthouses. The triangular shaped lighthouse is the only one in the United States equipped with an elevator. There is also an office space at the bottom of the tower. When first lit in 1962 the lighthouse had a complex array of high-intensity lamps that put out 28,000,000 candlepower. The bright light was intense enough to be dangerous so in 1967 a lower intensity light with 1,170,000 candlepower was put into use. In 1898 a lifesaving station was established on Sullivan Island just behind where the lighthouse now stands. The old building is still there and used by Coast Guard personnel as living quarters. Next door to it is the stations boat house where rescue boats were once kept that would have been hauled to the beach and out into the surf during an emergency. After visiting the Morris Island lighthouse earlier in the day we arrived at Sullivan Island by late morning just as a huge fog bank unexpectedly rolled in making it almost impossible to see the lighthouse even though we were right in front of it. It cleared for a few moments at a time, just enough to get a good look at this powerful lighthouse before it was once again swallowed up by the even more capable fog. The lighthouse isn’t open to the public but you can park, walk on the beach and get very close to it as well as the old lifesaving station.Just down the street from the lighthouse is Fort Moultrie built in 1809 and once used for coastal defense. In closer to Charleston you can also visit Patriots Point Naval Museum where you can tour the worlds largest Naval and maritime museum and explore the aircraft carrier USS Yorktown as well as many other naval ships. Fort Sumpter is also open for tours and it can be reached by one of two tour boats, one from Patriots Point and the other from the City Marina near downtown Charleston.